The SK1050 mini skid steer, offers easy access to the machine undercarriage and no daily maintenance points or grease zerks to help ease maintenance and reduce total cost of ownership. Equipped with a 37-hp Tier 4 Yanmar diesel engine, the SK1050 directs 30-hp to the attachment, giving operators the power to tackle an assortment of challenging tasks with more efficient and productive use of hydraulic attachments, including trenchers and augers. The attachment horsepower, combined with 15 gpm auxiliary flow and 3,625 psi, the SK1050 leads to quicker jobsite cycle times, making your crews more efficient and decreasing overall labour costs. With a hinge-pin height of 83 inches (2.1-m), the SK1050 enables efficient and flexible loading and unloading at a wide range of dump sites. 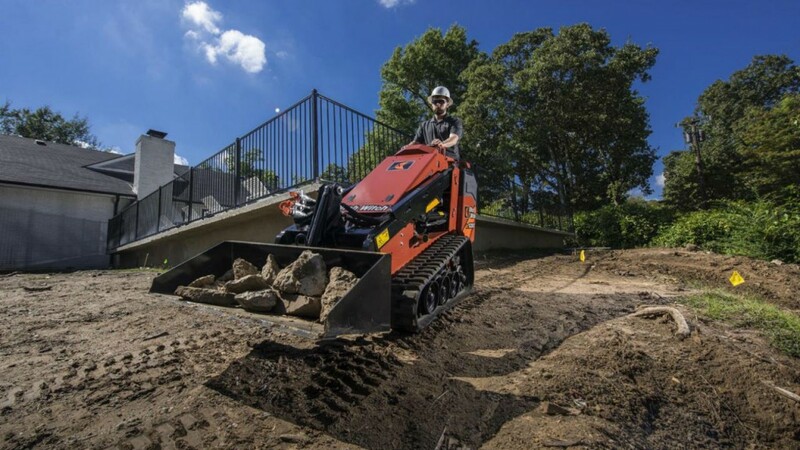 The machine’s 1,062-lb -pound rated operating capacity provides operators with exceptional stability in a variety of soils for effective maneuverability while carrying heavy loads. And, enhanced lift capacity ensures the machine can withstand maximum weight at maximum height. The best-in-class operator station includes a spring-supported, 74-inch-squared platform for enhanced comfort during long working hours. An easy-to-use auxiliary-control pedal gives operators the power to maintain hydraulic flow to the attachment while freeing their hands to control depth and ground speed. The machine’s LCD display includes programming upgrades to provide direct visibility into all engine diagnostics and performance for greater machine effectiveness. The Ditch Witch standard, construction-grade design is built for heavy-duty operation to help increase ROI and machine longevity. The machine’s proven, high-drive track system includes bolt-on, interchangeable rollers for longer lasting performance. The SK1050 also offers easy access to the machine undercarriage and no daily maintenance points or grease zerks to help ease maintenance and reduce total cost of ownership. The SK1050 mini skid steer, leads to quicker jobsite cycle times, making your crews more efficient and decreasing overall labor costs.